Expand the reach of your gate or door access control system with this post-mount AAS 12-000 RemotePro Wiegand output keypad unit by American Access Systems. This sturdy remote access code reader is designed to work in conjunction with the AAS Advantage DKS II key pad controller or the AAS ProAccess 200 multiple-door controller. It’s also compatible with other master security control stations using 26-bit Wiegand protocols. We sell the AAS 12-00 Remote Pro, the AAS Advantage DKS II and the AAS ProAccess series at North Shore Commercial Door. You can also order a gooseneck stand that’s designed to hold the post-mounted AAS 12-00. Use the slave port output on the AAS 12-000 Remote Pro to connect to the slave port input on your master controller using 6-conductor, 22-gauge wire. The instruction manual that comes with the AAS 12-000 RemotePro output keypad also demonstrates how to attach the unit to a gooseneck stand. With 16-gauge stainless steel faceplate and enclosure construction, this sturdy unit will serve you well for years. 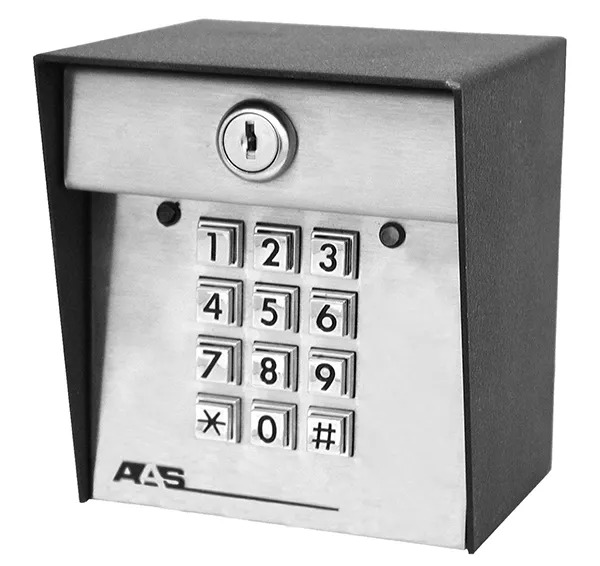 This AAS keypad has a user-defined facility code with on-board dipswitch settings, an LED indicator, audible tone and nightlight.